Tamiya proudly releases the Porsche 911 Turbo, further expanding our line of Porsche 911 series of models. Famed as the culmination of the 911 series, the Turbo's impressive design and performance made it the most well known member of the 911 series. 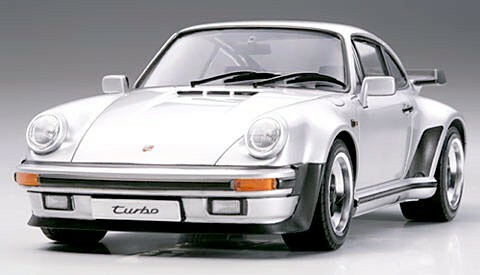 The 911 Turbo debuted in 1975 as Porsche's first street model to feature a turbo engine. The air-cooled, horizontally opposed 6-cylinder engine featured a KKK turbocharger, 3 liter displacement and 260 hp output. Models built after 1978 featured upgraded engine displacement and output of 3.3 liters and 300 hp respectively. The 911 Turbo's distinctive style, with its large-size rear wing and front and rear overfenders, coupled with its reliable performance grabbed the attention of car enthusiasts around the world.